Canter Coat Shine Conditioner Equimist Spray leaves the coat with an instant, long lasting shine that not only conditions the coat but helps to repel grass and stable stains. The non-greasy finish left on the coat makes it hard for mud and dirt to stick and therefore makes grooming far easier. 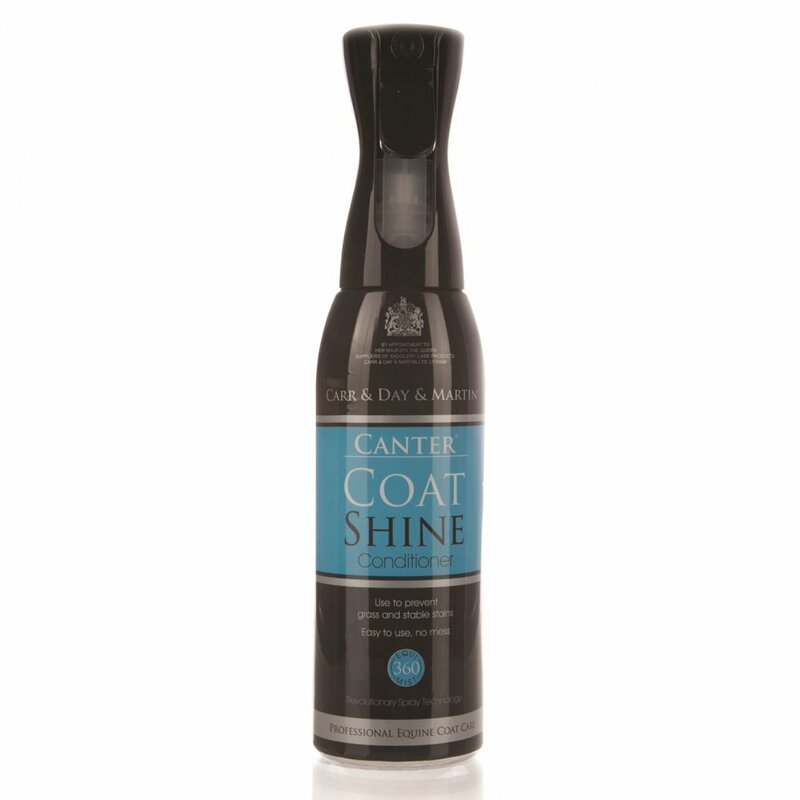 This coat shine spray is ideal for competition use as well as simply keeping your horse's skin in top condition. Canter Coat Shine comes in a revolutionary Equimist 360' spray bottle to ensure a perfect finish every time. Equimist can spray a full 360' to provide good coverage even when upside down, making it perfect for hard to reach areas. Equimist bottles have a wide spray pattern and produce a fine mist to improve coverage, and are also much quieter than traditional trigger spray bottles making them better for horses that don't like the noise of a spray. Equimist is also better for the user as the packaging technology provides unbeatable bottle evacuation for less wastage and reduces hand fatigue due to the ergonomically designed trigger head and continuous spray technology. Spray Canter Coat Shine evenly over the coat and then wipe over with a cloth for best results. This Equimist spray can be used on both wet and dry coats and leaves instant results that last up to 7 days. Canter coat Shne Conditioner contains silicone shine agents and a citronella scent.